Bridgestone's new Greatec M845 wide-base radial (left) and M860A high-scrub all-position radial, both for heavy-duty urban use. NEW ORLEAN—Bridgestone Commercial Solutions has unveiled two Bridgestone tires for heavy-duty urban use: the Greatec M845 wide-base radial and M860A high-scrub all-position radial. The tires made their debut at WasteExpo 2013—an event in New Orleans for waste management and recycling industry professionals. "Stop-and-go driving, oil and chemical residue, pot holes, metal plates, cracked paving, weather—all these road conditions and more pose unique challenges to urban-use tires and are compounded by heavy duty job demands, such as urban waste collection," said Bert Jones, manager, product marketing, TBR, retread and OTR, for Bridgestone Commercial Solutions, a business unit of Bridgestone Americas Tire Operations. "The new design innovations in these tires help prolong tire life, retreadability, and keep the tire performing to highest levels." Bridgestone said the M860A reflects improvements made to its Bridgestone M860 line, featuring a new compound that improves wear performance and a wider belt package that enhances casing durability, making it more retreadable and extending casing asset life. The M860A is designed specifically for refuse, high-scrub and short-haul applications, the tire maker said, with aggressive blocks to bite into soft surfaces for better traction; stone rejector platforms; angled grooves to promote wet traction; solid shoulder design to distribute weight evenly; and torque to fight irregular wear and block squirm for even wear. 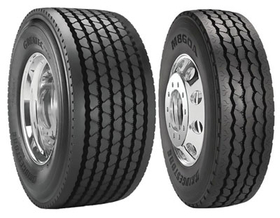 The Greatec M845 wide-base radial is engineered for high-traction and high-scrub applications, Bridgestone said, with a wide-base tire design to support heavier loads, reducing the number of trips required. The company said the M845 Next-generation WavedBelt technology reduces irregular shoulder wear. The tire also is equipped with stone rejector platforms to prevent trapped stones; optimized groove shape; an aggressive block pattern that promotes wet traction; and a continuous shoulder design for reduced rolling resistance. The Greatec M845 will be available in a new size for Bridgestone—455/55R22.5—in July. The M860A will be available in 315/80R22.5 in June.